Ken Schram Photography: What's in it for me? I know I've said it before, but I have to say it again. Photography for me has opened my eyes to a whole new, incredible world that I've previously walked through without taking notice. Take this duck for instance. My wife is very much into birding and she's trying to convert me too which is the reason for the high volume of bird related shots lately. She loves to research and learn more about our feathered friends. After capturing this very colorful duck, neither of us knew what it was until she looked it up. For those who know their ducks, please forgive our ignorance. 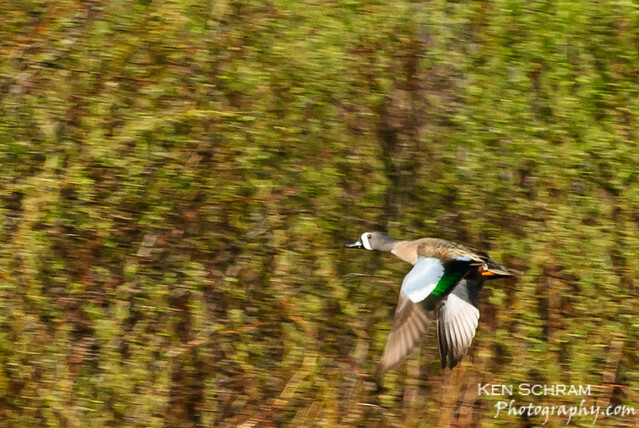 For the rest of you, this is a Blue-Winged Teal. Evidently it's one of the most common ducks in North America, yet this is the first time I've ever seen one - or at least it's the first time I've ever actually "looked" at one. Beautiful.